On this page, I will describe how to solder new batteries to a Sun NVRAM chip to get it working again. The way I do it is not the only way, see http://www.bhargavaz.net/nvram/nvram.html for another description. 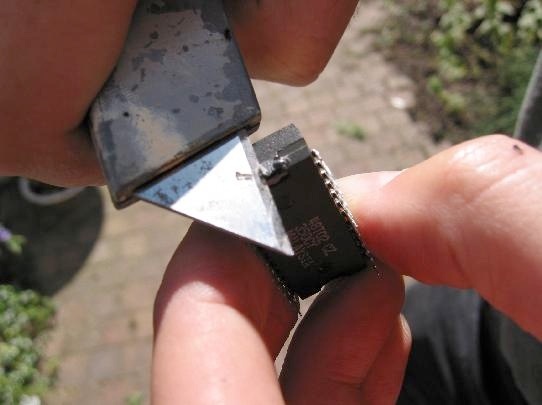 If you do not feel comfortable soldering, and have a few bucks to spare, you could just buy a new NVRAM chip, either the original SGS-Thomson Timekeeper chip, or a compatible (several companies make them, see the squirrel faq, the link is at the bottom of this page). So fix your NVRAM using this guide only if you have soldering skills and are not faint of heart. I made the pictures on two occasions, most show an NVRAM with a yellow sticker (which I come across often), some show an NVRAM with a white sticker (from my SLC). 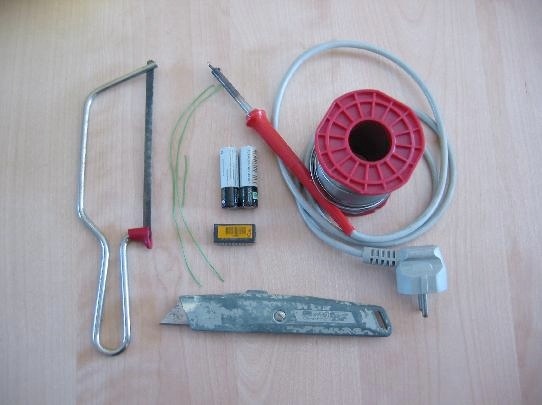 You'll need the NVRAM with the empty battery, two 1.5Volt batteries (even used ones are okay), a soldering iron, some wire, a saw or Dremel tool and a knife. When taking out the NVRAM, carefully note on which side the dot is! The NVRAM should be reinserted the same way it came out. Scrape off the epoxy of the NVRAM on the side opposite the dot. Behind the epoxy are metal wires which need to stay intact. Scrape away until you see the wires. You can solder new batteries to it directly, which will work, although now the new batteries are parallel with the existing battery. I normally remove the existing battery, by taking the saw and saw the top half in two, in the middle of the NVRAM. 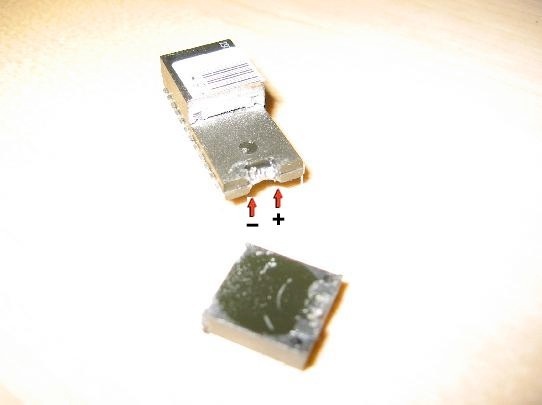 The half with the dot contains a crystal, the other half a 3V battery. 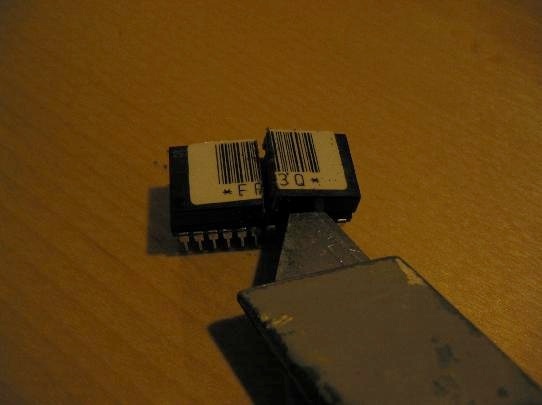 Try to keep the pins from bending. 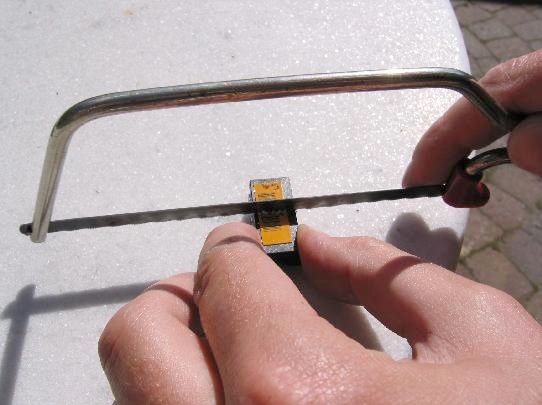 Now use the knife to lift the part with the battery (opposite the dot). Now, gently wiggle the top piece with the battery until the wires break, use the knife on the epoxy on the side if needed. The battery should now come off, with pieces of the wire (that's okay). The wires from the lower half to the top half will be visible now. 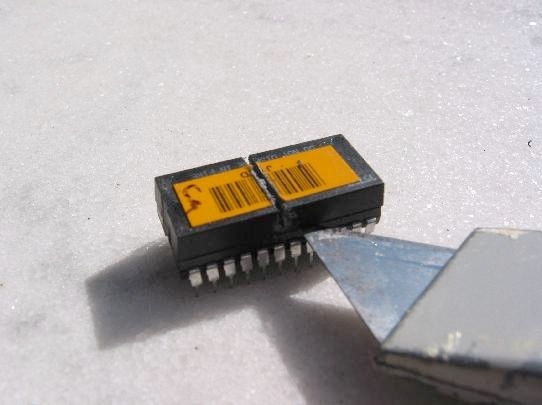 If needed, scrape away a bit more until you feel confident that you can connect wires to them. Dispose of the battery in an environmental-friendly way. The two exposed wires should be connected to the batteries. Solder a short piece of wire from one battery's plus to the other battery's minus, putting them in series. Solder a wire from the piece of wire close to pin 12 to the minus of the first battery and a wire from the piece of wire close to pin 13 to the plus of the second battery. The pins are number 1-24, starting at one at the dot, going down the row to 12, then opposite 12 is 13, going up to 24. 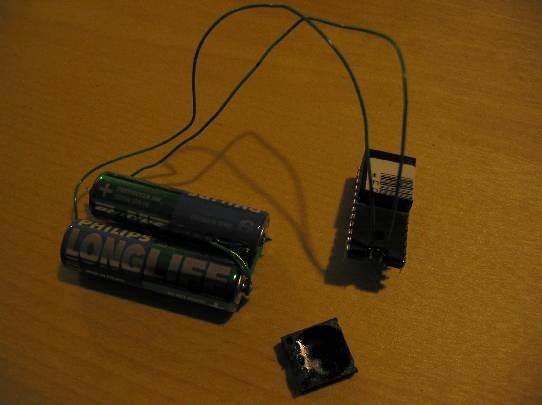 You can use penlites, or any other batteries, as long as it provides 3Volts (you can also use one 3Volt button cell which takes less space and generally looks nicer). If you like, you can use a battery holder as well. Cover all bare wires with something insulating (scotch tape for instance). 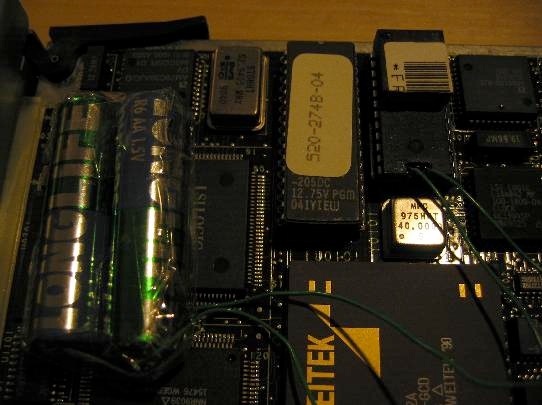 If you have epoxy you can use it to put on the NVRAM where you attached the wires. Now you are ready to insert the NVRAM into your Sun. 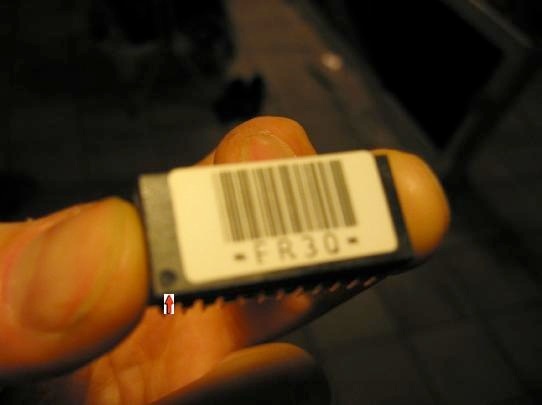 Make sure you insert it correctly (the dot on the right side) and be careful in case some pins were slightly bend. The picture shows a Sun SLC. 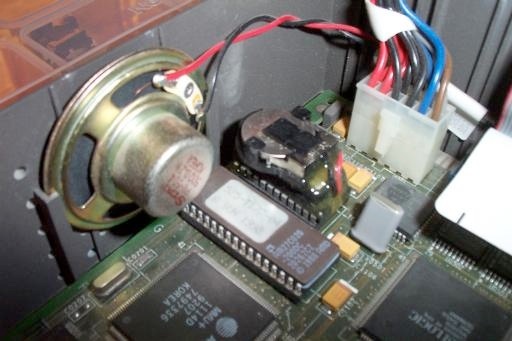 Here's a picture submitted by David Griffith of his IPX with a fixed battery, using a button cell in a battery holder. All that's left now is to boot up the Sun and reprogram the NVRAM. See the excellent NVRAM FAQ for information on how to do this.